Improving your net profit margin is easy, when you know how, no matter what type of service or manufacturing business you have. Even small, single operator businesses can see double the net profit, in months, without spending more on advertising or even increasing leads. That’s common, but when you’ve seen over 2 decades of results with hundreds of business as we have, you’d think it was easy too! There are so many more client results that could be listed here, but you’re probably wondering how this is possible, so let’s dive into that now. “Profit is king” as they say, but actually its not quite true. A net profit of $200,000 is quite a lot, but on a $10,000,000 revenue company, its actually only 2%. That’s a very small percentage of the revenue. The percentage net profit on yearly revenue or net profit “Margin” is the true king and the most important KPI for any company. The higher it is the more cash you will have in the bank, to save, to pay for advertising or to pay yourself a lot more. With more cash you can afford to pay an extra person, like a manager, to seriously free up days in the week of your time. It can solve nearly every challenge your business has now or in the future, including recessions or industry downsizing. Increasing the net profit margin should be nearly every company owners goal, because 90% of all businesses operate with a net profit margin that is “low”. Ever heard of a business failing, while it has loads of cash in the bank? Our training is about giving you specific details to implement our highly refined strategies on 7 topics to increase your business’ net profit margin by 5% to 20% in months. Once a service or manufacturing company reaches $700,000 in revenue, it’s time for it to focus on increasing the net profit margin, not just sales. What few company owners realise is that as revenue increases beyond that figure, net profit may too, but NOT proportionally. This diagram is important to show what happens over years. 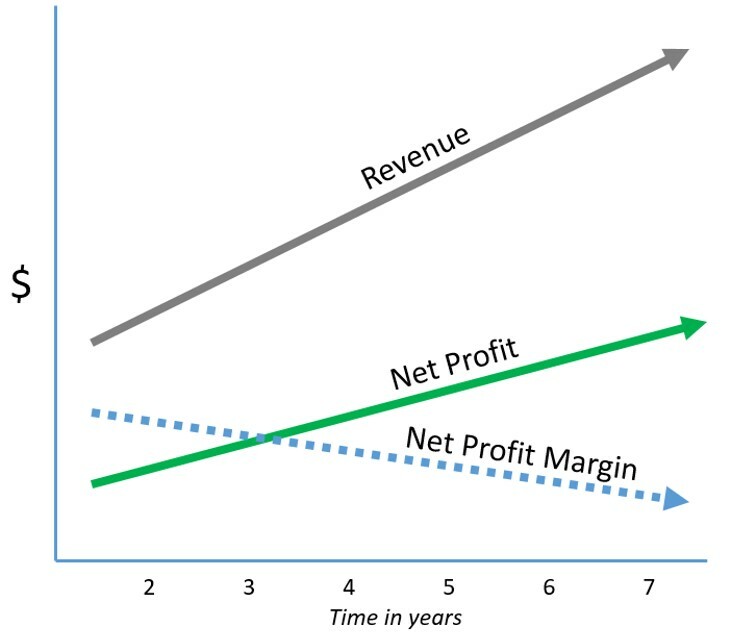 As the graph shows, the net profit margin usually drops each year even though both revenue and net profit are increasing. What that may mean to you is that each year cash reserves are decreasing, causing more stress and concern. Few company owners look at the net profit margin percentages with all the challenges of growing their business. If you’re considering any quality business training, strategies to increase your business net profit margin should be high on your priorities. A quality business training workshop that increases net profit margins also leads to a significant improvement in the business and owners’ life too. The business training provided by our company is unique in the market place, which you can see by our consistently outstanding clients’ profit margin increasing results. Increasing net profit margins has been our focus since our training started in 1997 with hundreds of clients increasing net profit margins since then. Every business has 5 to 10 profit margin increasing opportunities and a range of proven strategies to use to achieve a net profit margin increase. Our premier training, called the Academy of Business Mastery has everything you need to increase your business net profit in 6 to 12 months. Our clients’ remarkable results verify that. The Academy was created on 7 topics from solving hundreds of business owners challenges for over 20 years. Would it transform your business and life to conquer all of these pemanently? The Academy training provides you with time-saving, ready to use systems for motivating employees and hiring hard to find good attitude ones, with powerful ads that “attract” them. You also receive a complete set of ready to use management report templates ready to customise to your own company. Understanding your business numbers with weekly reports is essential to find “profit opportunities” to double your net profit in months. You also get our input on what reports you need to setup in software such as SimPro, AroFlow, WorkflowMax. The deep understanding of management we bring to you comes from inspiration from the billionaire Rupert Murdoch. That began in 1999 when one of his managers went through the weekly reports that Rupert demanded be sent to him every week. The reports have been refined since then to be perfect for any service or manufacturing company. 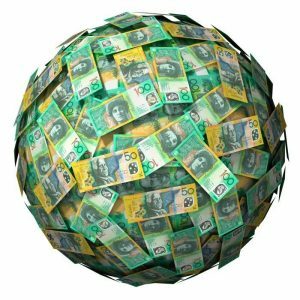 Our Academy is the most established, practical and comprehensive training in the Australian market place for $600k+ revenue company owners. It is only for company owners, not for employees. It’s also the only training in Australia recommended by 17 accounting firms, who experienced the content first hand saw clients financial statements improve from the training. If you want to achieve a true breakthrough with your company and personal life this is the training for you. Are You Ready to Explore Super Success – Risk Free – for Your Company? 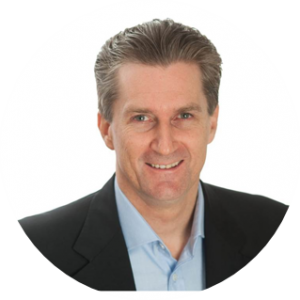 You can keep reading this website or visit others, but the best investment of your time is to simply have a chat with Tim Stokes, the founder of Profit Transformations. Call 1300 778 377 today and you may catch Tim for a quick initial chat about your interests and business goals. A quick chat is good for both you and Tim as he’s selective with the types of clients he takes on for any training. You won’t experience any pressure on you at any time to do anything during or after the call. That’s because our best clients want to do the training; they’re never pushed into it. Our ‘integrity first’ policy is what has maintained our excellent 5-star Google Review rating and 17 accounting firm recommendations. You’ll know in minutes if Tim is someone you want to talk more with or not. Either way, with a phone call you’ll save a lot of time. It could be the most refreshing conversation you’ve ever had on growing your business. When was the last time you talked to someone with 34 years experience of building six successful service businesses? To book your ‘breakthrough meeting’ on a day and time that suits you, just pick one below, and enter your contact info so you receive the meeting confirmation. Next, make a list of tough questions to ask Tim, on anything to do with growing your business, what results to expect, case studies etc. Tim will happily and honestly answer any questions, even if you’re skeptical of results and have tried a business coach with no success. Tim is not a business coach. Training on ready to use strategies and systems that focus on doubling net profit without any marketing cost is far superior to any business coaching. This is one of dozens of results that can be discussed in your breakthrough meeting.